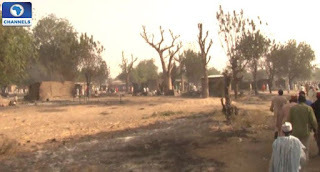 The Nigerian Army on Wednesday said its troops had killed 11 Boko Haram insurgents and destroyed a bomb making factory at Ngala Local Government Area of Bono. Brig.-Gen. Sani Kukasheka, the Director, Army Public Rations said this in a statement in Maiduguri. Kukasheka said that the troops, in joint operations with the Air Force and Civilian Joint Task Force (CJTF), on Tuesday attacked insurgents’ hideouts at Mogole, Ngaiwa, Tongule, and Warsele villages of Ngala Local Government Area of the state. He disclosed that the troops destroyed the insurgents’ logistics base and a workshop at Ngaiwa village and an Improvised Explosive Device (IED) making factory at Tongul. The director further said 85 persons were rescued from the insurgents in the villages. Kukasheka said that the troops also recovered a gun truck; four suicide bomb vests, various IED making materials, three Dane guns. Others, he said were: one Barretta pistol, 22 rounds of 7.62mm ammunition, 5 motorcycles, 13 bicycles and a wheelbarrow. “Tuesday Oct. 24 will go down as one of the best in the outing of troops of 3 Battalion, 22 Brigade Nigerian Army of Operation LAFIYA DOLE in their daily clearance of the remnants of Boko Haram terrorists, especially in northern parts of Borno. “The unit in conjunction with gallant 22 Mobile Strike Team accompanied by Civilian JTF, based on credible information carried out offensive operations at suspected Boko Haram terrorists hide outs at Mogola,” he said. Other areas where the soldiers carried out operations he said were Ngaiwa, Tongule and Warsele villages in Ngala Local Government Area of the state. “The operation which was supported by the Nigerian Air Force was very successful in achieving its objectives”.